As we near the release of Ces Cru’s highly-anticipated, February-bound album, Catastrophic Event Specialists, The Kansas City emcees have unveiled their first set of album visuals, bringing “The Process (Guillotine)” to life. 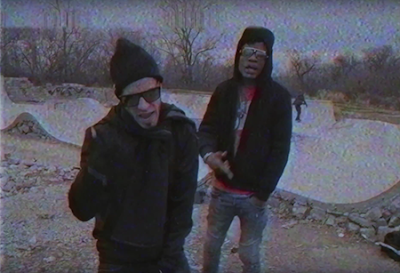 Matching the throwback feel of the song Tech N9ne recently raved about, the visuals feature some striking shots of the Cru through a fuzzy, VCR-esque lens that will give flashbacks to those old enough to remember having to rewind tapes. Those who are too young, will surely be familiar with the locations and settings Godi and Ubi have chosen, a tongue-in-cheek shot at the factory-made rappers who churn out factory made visuals. A pointed, headnodic song with a throwback feel, “The Process (Guillotine)” sets the tone for Catastrophic Event Specialists, due out February 10th.